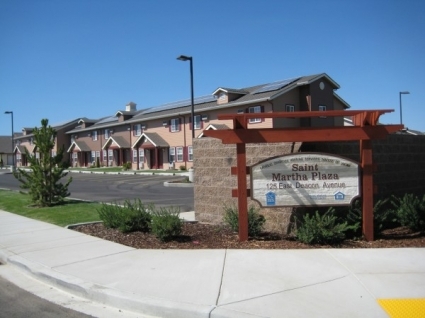 St. Martha Plaza does not have direct subsidy but offers affordable rents for low income households through the Washington State Housing Tax Credit Program. We also accept Housing Authority provided Section 8 vouchers. WSHFC Tax Credit income limits apply. Please call for details, eligibility and availability of units. St. Martha Plaza provides 50 units of permanent housing for low-income families, plus one resident manager's unit. Three quarters of the units are set aside for agricultural worker families. The project also includes a community building containing a computer lab, laundry facilities, office area, kitchen, and a great room for community gatherings as well as for CCHS to provide learning activities such as "'Play and Learn" for parents and children on site. The residential buildings are arranged around a central open area with play equipment for children including a basketball court and playground area. The City provides transportation. Contact the City Hall for more information. Income Limit Details: Below 50% Very Low Tax Credit income limits. Seventy-five percent of the units are reserved for households earning 40% or less of area median income (AMI), 10% of the units are reserved for households earning 30% or less of AMI and the balance are available to households earning up to 50% AMI. Rent Detail: St. Martha Plaza does not have direct subsidy but offers affordable rents for low income households through the Washington State Housing Tax Credit Program. We also accept Housing Authority provided Section 8 vouchers. WSHFC Tax Credit income limits apply. Please call for details, eligibility and availability of units.